A diagnosis of Parkinson’s can be devastating, particularly when the doctor makes the point that it is a progressive and debilitating disease with no cure. Or worse still, the patient is told that medications will only be effective for a certain number of years. We’ve heard some dreadful stories of how patients were left feeling hopeless and in despair. Without making light of the impact that Parkinson’s has on the body, mind, and spirit, our message is more hopeful. People can live a fulfilling and productive life. People living with Parkinson’s are making a difference to their own lives and to the lives of their fellow “Parkies” every day and in all sorts of ways, simply by sharing their experiences of life and what they’ve learned about how to live an active and engaged life. Through our education programs and outreach events we provide information to answer the many questions people have on how to make the most of their lives beyond the usual focus on exercise and communication. As part of our education programs we want the professional caregivers and allied professionals who you might have on your interdisciplinary team to have not only a solid understanding of what Parkinson’s disease is, but what life is like for someone who has been diagnosed. With this understanding these professionals can work with our friends on a higher level with humanity and compassion. We provide in-service training for allied professionals; for example, companies that provide in-home care, assisted living communities, or rehabilitation centers. For more information, please check out our Resource Center or contact us. Along with our cafés, here are some of the other events where the Parkinson Social Network has been out and about. This year we opened two new cafes to reach out to the Parkinson’s community in person. We also participated in bringing awareness through social media. Sonia Gow, founder and president of the Parkinson Social Network, and Carol Barrett, a member of the network whose husband was diagnosed with Parkinson’s in 2002, discuss what caregivers need to know about the disease including how to find services. They also discuss the unique role the Parkinson Social Network plays in helping people with the diagnosis and caregivers cope and support each other. PSN shared information about Parkinson’s disease and our organization. Parkinson Awareness Month in 2017 was special because Parkinson organizations around the world worked together to bring attention to the fact that Parkinson’s was first described 200 years ago. 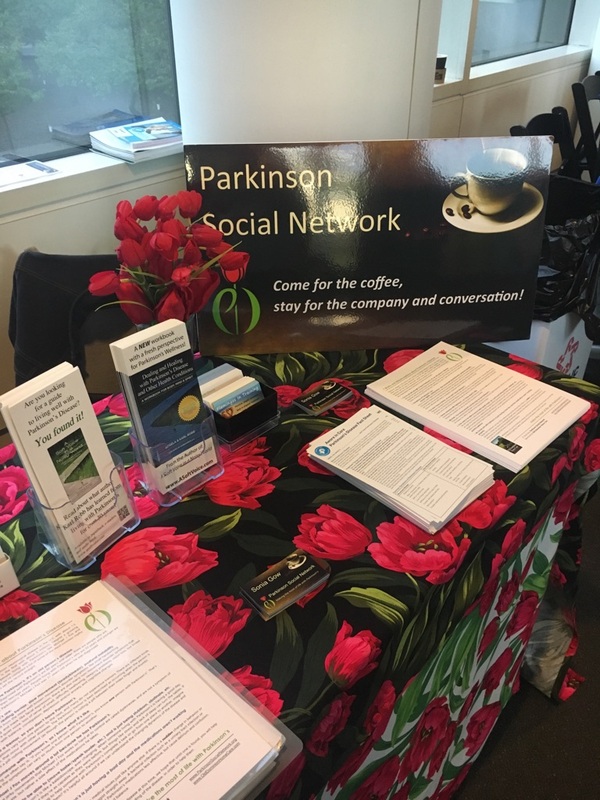 PSN set up a table at our local Inova Fair Oaks Hospital on eight days throughout the month with information about Parkinson’s, local resources and services. We were joined by volunteers from several local support groups. Sonia Gow gave a presentation entitled “Patients are people too!”. We were an exhibitor at this event, sharing information about Parkinson’s disease and our organization. This event was held in Adelaide, South Australia and was attended by Sonia Gow, Founder and President of the Parkinson Social Network. While in Adelaide, Sonia also attended several events organized by the state organization, Parkinson’s SA, and visited their main office. shared local resources and services with her audience.